Matchup Summary: This is the first meeting between these two teams this year. The New York Knicks are currently ranked second in the conference while the Celtics are eighth. Both teams come into this game coming off of victories. 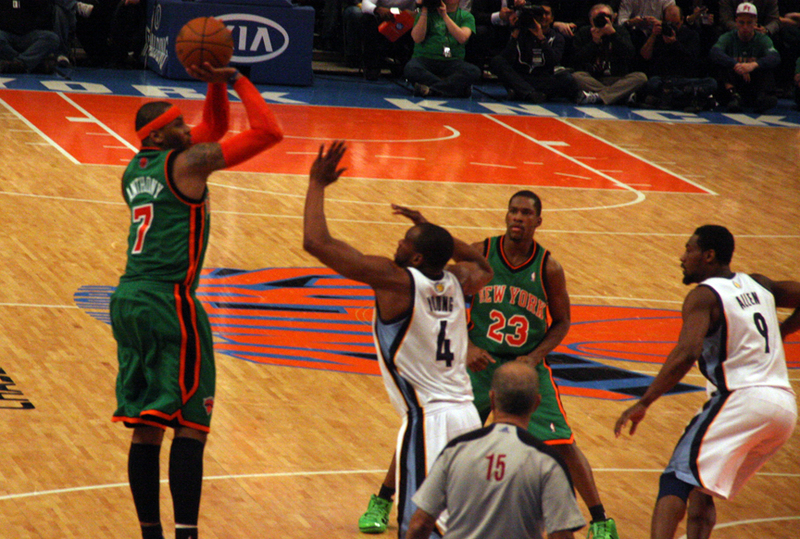 The Knicks defeated the Magic 114-106 in Orlando, and the Boston Celtics defeated the Hawks 89-81 in Atlanta. The Knicks are attempting to dethrone the Celtics as Atlantic Division champions, and a victory versus Boston here would be a big step towards that. Rajon Rondo is having another stellar season. One of the leagues more versatile players, he is an excellent defender and playmaker. Rondo is leading the National Basketball Association in assists at 11.4, is sixth in the league in steals, and is the second-leading rebounder for point guards at five rebounds per game. Rondo posted a triple-double in the previous game versus the Hawks, notching 14 pts, 10 assists, and 11 rebounds. He has become the leader of the Celtics and the team marches to his beat. Rondo is a modern day version of Jason Kidd in his prime. Jason Kidd is still a solid and smart player, and now can hit the open three, but he will have trouble keeping up with Rondo in this matchup. When Kidd looks at Rondo he is sure to see former images of himself. Both of these players are spot starters, who start to allow a more potent player to come off the bench as the sixth man, Bradley for Jason Terry, and Brewer for J.R. Smith. Bradley and Brewer are both defensive specialists with limited offense. Bradley has shown to be a more reliable spot up three-point shooter than Brewer, and applies more on-the-ball pressure on defense. They both average roughly 20 minutes per game, but will usually find themselves on the bench during the crucial stages of the game. Avery Bradley, however has the potential to have a greater impact. This iconic matchup between two future Hall of Famers is always a good one. Paul Pierce’s production has declined with age, averaging just 19.6 points per game this year. Meanwhile, Carmelo Anthony is having an MVP season, currently second in the league at 28.9 points per game. Anthony has become a complete player, drastically improving his defense. He is having the best season of his career, and is the main reason the Knicks have been near the top of the Eastern Conference this year. Brandon Bass has developed into a nice complimentary player, capable of hitting mid-range jumpers, and can provide a physical presence in the paint. Marcus Camby is coming off of an injury and was recently inserted as a starter. Camby’s role is mainly to provide defense and rebounding. Brandon Bass is more of a scoring threat, but is not as strong on defense as Camby. Bass’ youthful legs allow him to play more minutes, and he will have a greater impact on the games’ outcome. Kevin Garnett is another Celtic veteran playing in his 18th season. He is still productive, averaging 15 points and 7 rebounds. He is not the all-world forward that he was in his younger days, but is still a very solid player. He is no longer able to dominate games, but on any given night Garnett is capable of being a major factor. Tyson Chandler is leading the league in Field Goal percentage at 70% and is the Knicks’ defensive anchor. Chandler’s value can be seen in the fact that he is almost automatic when it comes to finishing around the basket, and he has earned the Knicks several extra possessions with offensive rebound tip outs. Chandler’s numerous ways to affect a game at this point make him more valuable than Garnett. The upgrade of the bench is what many analysts thought would make the Celtics contenders once again this year. So far it has not worked out that way. Jason Terry is still one of the best sixth men in the league, Jeff Green is a talented up-and-coming young player, and the rookie Jared Sullinger has shown some promise. The Knicks bench has been empowered with the return of Amar’e Stoudamire, who scored in double digits for the first time since his return against Orlando. J.R. Smith is probably the leading candidate for the Sixth Man of the Year award, and Steve Novak is seventh in the NBA in three-point shooting at 44%. This game will very likely be decided by the play of the reserves, and the Knicks have the advantage here. The Celtics reign as the kings of the Atlantic Division is coming to the end, and the Knicks are pushing hard this season for a serious playoff run. The Knicks depth and outside shooting, accompanied with the unstoppable scoring of Carmelo Anthony should be enough to bring home a victory on their home court where they are 13-3 so far this season.